There has been growing scientific and popular concern in recent years with loss and degradation of forest resources, particularly old-growth, as a result of human activity (Norse 1990; Pyle 1988; Rajala 1998). "A little over 50 years ago, more than nine million acres of Washington's forests were comprised of old-growth. Today, our state has 2.6 million acres of old-growth forest remaining, most of it found at high elevations in national forests and parks" (WADNR 2001, 22). 1. A description of how the natural forest ecosystem functions. 2. Presentation of original data documenting the patterns of forest cutting within the Gray's River watershed. 3. An examination of several potential scenarios for forest cutting in the 21st century. As trees grow, they alter their environment and demands for resources. This growth triggers changes in the microclimate and creates a situation where a succession of species can take hold that are better suited to the changing sets of conditions. One species establishes a claim on newly available habitat and in turn is succeeded by other species (Norse 1990). Some trees gain resources at the expense of others. Competition is particularly intense when only one species is present because requirements for resources and the adaptations available to obtain them are nearly identical for all individuals (Waring and Running 1998). When more than one species is present, access to resources differs as a result of the uniqueness and adaptability between species. As the trees get taller, conditions beneath the canopy continue to change, generally getting shadier, cooler and wetter. These changes, in turn, trigger modifications in the species and density of vegetation. The sequence of changes that occur represents the process known as succession, a change in composition and structure in response to environmental changes. When a forest ecosystem is disturbed at any stage of development, the vegetation complex returns to an earlier stage and the succession begins again. If disturbance does not occur over a period of several centuries, an old-growth forest develops. There are many definitions for old-growth (Appendix A). In all these definitions the key defining elements are an old-growth systems ability to reproduce and maintain a diverse mixture of species, the development of a complex physical structure, and the dominance of long-lived species of trees. The space beneath the old-growth canopy cover is very large and vertically differentiated into microhabitats supporting a high diversity of plant and animal populations. The heavy shade from the canopy produces a generally open landscape extending to the ground below. Old-growth forests contain understory tree species that are shade tolerant, allowing them to regenerate in the shade or in openings in the canopy where older trees have died (Bolsinger et al 1997). Old-growth forests contain an abundance of standing dead trees, broken tops and dead logs on the forest floor. The forest floor also supports diverse groups of shrubs, herbs, and mosses. Bunnel and Mcleod (1997) describe the typical coast range forest floor containing a bio-mass of large diameter snags exceeding 400 cubic m/ha. Many of the oldest trees in an old-growth forest show little if any height growth. In many cases, tree tops have died, but diameter growth continues (Waring and Running 1998). Old-growth in the Pacific Northwest is dominated by conifers, the most wide-spread being Douglas-fir (Pseudotsuga menziesii), western hemlock (Tsuga heterophylla), sitka spruce (Picea sitchensis), western red cedar (Thuja plicata), and Alaska cedar (Chamaecyparis nootkatensis) (Franklin and Dyrness 1969). In some situations the longest-lived conifer species may be 3,500 years old (Norse 1990), reaching heights of 300 feet and diameters of 15 feet. The term "second-growth" describes the re-generating forest following a disturbance to the old-growth forest. When disturbances occur, the growing conditions for plants are dramatically altered. Removing the forest canopy results in increased light, higher temperatures, and increased variation in the seasonal availability of water; all operate to change the composition of the vegetation. Second-growth re-generation is initiated by increased light on the ground. Shade-adapted species that thrived in an old-growth environment lose their competitive edge. Seedlings of light-loving species that could not survive in the deep shade of the mature forest canopy quickly become established, responding to improved light conditions. These become established as the first, or pioneer plants on the site. Pioneer species are fast growing in the new high sunlight conditions as compared to non-pioneer species, providing them with a competitive advantage over non-pioneer species. The forest is regulated by a complex interplay of biological, hydrological, and geo-morphological processes that require decades or centuries to develop. Frequently these processes may be interrupted by natural disturbances on a landscape (Montgomery 1997). Natural fires can consume large tracts of forest. Flooding can wash small areas of the forest into the river. Landslides and other slope instabilities alter the topography in limited areas. Disease and insect damage can also interrupt forest process by selectively killing tree species (Hartwell 1969; Scharph 1993). Wind is a major agent of natural disturbance that renews and modifies the forest environment (Bunnel and Chan-Mcleod 1997). Collectively these natural disturbances serve to destroy, modify, and ultimately renew the forest environment. Since they are frequently localized, natural disturbances are viewed as normal and relatively minor in their effect on the overall forest health. From a timber industry standpoint, the term "old-growth" describes a situation where large trees in the mature stages of their life cycle dominate the forest (Aplet et al 1993). If the average house used 10,000 board feet of wood, the volume of wood obtainable in a single old-growth tree is enough to build 6 average sized houses. Old-growth stands average 65 mbf (thousand board feet) per acre (Figure 2) and in some places produce as much as 150 mbf per acre (Harris 1984). Clear-cutting as a harvest practice results in the most dramatic human impacts to the forest ecosystem, producing disturbances that affect plants and animals alike. Removing large tracts of trees forces the land back to an earlier stage of succession. Clear-cutting artificially triggers the same consequences that occur with natural disturbance, but often over larger areas. The impacts of clear-cutting as a forest management strategy may be detailed under these headings: soil and stream modifications, fragmentation, and simplification. The soils that remain on a hill slope after clear-cutting do not function the same as they did under a forest canopy. The physical characteristics of the soils are modified as the environment is modified. Clear-cutting creates a self-perpetuating cycle: fewer roots allow more soil to erode so less vegetation can grow (Kimmins 1997). After clear-cutting, the infiltration rate, porosity, and permeability of soil are changed (Franklin 1993). As illustrated in Figure 3, removal of the forest changes the local hydrology, which can increase soil erosion and trigger landslides (Rajala 1998). Soil within a clear-cut is less stable during the rainy season and becomes hard and crusty during the dry months of the year (Franklin 1993). Un-vegetated soil promotes the establishment of sheet flow and other erosional processes. The water table temporarily rises and runoff increases in an area that has been cut over (Raphiel 1981). Forest removal is also associated with increased river-bed siltation and loss of habitat area, leading to reduced fish numbers. Fragmentation is another impact to the forest ecosystem resulting from human activity. Human-managed forests are often discontinuous in extent, fragmented by logging roads, clearcuts, and firebreaks. In many managed forests logging roads can reach a density of 6 miles per square mile (Pynn 2000). Logging roads effectively create treeless paths wide enough to interrupt the continuity of the forest, soil, and ground vegetation. Forest roads serve as barriers that some plants and animals are unable to cross (Harris 1984). Forest roads also provide a pathway for the introduction of disease which further disrupt the natural ecosystem throughout the forest (Scharph 1993). Road construction (Figure 4) dissects the continuity of the forest ecosystem and is an important cause of forest fragmentation. Forest roads are a 50-100 foot wide treeless pathway that impact the continuity of the forest ecosystem by fragmenting it into pieces. Forest roads increase soil erosion and interfere with surface water drainage by channeling surface water away from the road surface through ditches and culverts. Roads significantly increase the occurrence of mass wasting if the road drainage is poorly designed and maintained. Roads are the major cause of landslides and stream sedimentation (Raphiel 1981). Landslide frequency is linked to the density of the road system, especially on steeper topography (Franklin 1993). Fragmentation of the forest can occur as a result of clearcutting patterns. Remnant tree islands become detached from the forest as a result of the land owner's clearcutting rotation and, in the extreme case, become totally isolated from other stands. Figure 5 illustrates an extreme example of the creation of tree islands in the upper Gray's River watershed. A forest island's effectiveness to support a diverse group of species is determined by its size and proximity to other forest islands (Kimmins 1997). Once clear-cutting has occurred, regulation and human silvicultural practices become responsible for the revegetation that follows. 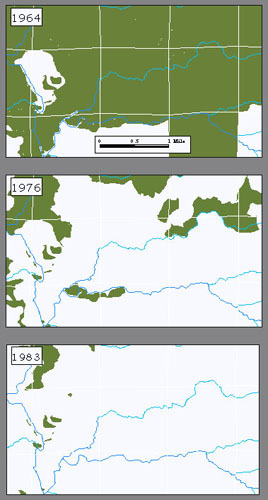 The creation of new forest succession patterns are the result of human control over the growing environment. Rather than proceeding at a natural pace, humans attempt to speed up the forest succession process to quickly return to a situation where harvesting is again possible. Reforestation of the disturbed area after clear-cutting also emphasizes maintaining control over the distribution and quality of forest species. Simplification is a state that results from the forest being harvested before it reaches maturity. Logging simplifies forest ecosystems (Dudley et al 1995) by narrowing the age range of the stand and suppressing diversification through repeated harvesting, burning to remove slash, and replanting with hybrid seedlings. Simplification affects the health and productivity of the forest because simplified forests lack the variety found in older stands, including species diversity, vertical structure, and microhabitat. From an ecological standpoint, a simplified forest of a particular age has less overall bio-mass per acre than a natural forest of the same age, but a simplified forest produces a higher volume of merchantable timber. The level of forest complexity differs between old-growth and second-growth forests (Appendix B). Forests managed to maximize wood volume are biologically simpler than old-growth forests because once trees are removed, many associated plant and wildlife species can no longer survive (Harris 1984). The forest floor after harvest is often cleared of debris including removing large decayed logs (Kimmins 1997). Figure 6 illustrates a time scale of forest growth and the differences between younger more simplified and older more complex forests. The growth of non-commercial forest species is chemically or mechanically suppressed to make more room for commercial forest species. 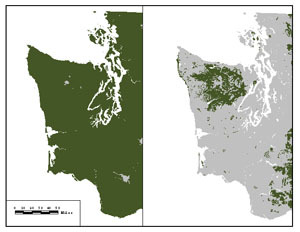 Forests of western Washington are re-planted with a monoculture stock even in areas that previously supported a wide variety of other species (Noss 1993). Laboratory grown seedlings are hand-planted before more biologically diverse natural growth can regenerate the forest (Norse 1990), thus injecting an artificial competitive edge into the natural succession process.